Part of the fun and part of the agony of my job is that tech companies often offer to show me something cool several weeks before they go public with it, under the condition that I keep my lips zipped until The Big Day. The latter half is the agony part. Sometimes, anyway. Because I get the briefing and then I find myself sitting on something so gorgeously bizarre that I can’t wait to talk about it. …described only as a piece of Mystery Art for an upcoming project. 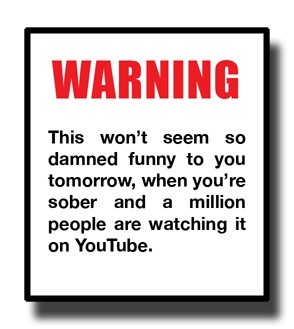 No harm done…though some part of me worried that people would be able to figure out what this was for. There are a couple of telltale…well, tells. It’s obvious if you’re familiar with the product in question. Well, today the NDA is over and done with and I can tell you what this piece of artwork is for. But why tell you, when through the miracle of the fine work of the Joint Photographic Experts Group? 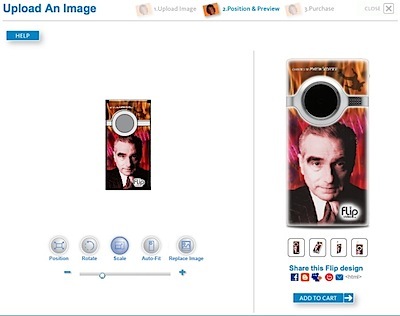 Yes, the fine makers of the Flip Mino pocket digital video camera have added a new twist: if you order online, you can now customize your Flip at no extra charge. Pick from a library of hundreds of stock images, use their online pattern and texture generator…or just upload a JPEG. Which, naturally, was what drew my immediate interest. It’s not revolutionary, it’s not a game-changer, it doesn’t an anything-killer. It’s a completely unnecessary. And of course, under the skin it’s the same Flip Mino, with the same limitations. Flip sent me a coupon code so that I could try it out for myself. I loaded up my Flickr album of Good Photos, and hastily eyed the shot of Peter Cohen’s Apple hair. But my hand was soon stayed. This is a video camera. A camera which I can customize with any image. Was a dude with an Apple logo spray-painted into his hair really the best choice? 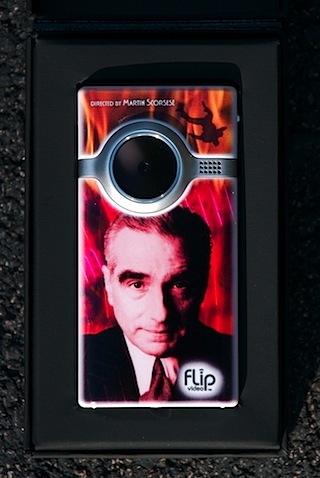 But as soon as I got the idea of owning an (un)official Martin Scorsese Flip Mino, an alarming percentage of my CPU’s duty cycles were irrevocably committed to the project. Of course, the front face of a Flip Mino is not exactly a forgiving medium. I found out after I made a Photoshop template and struggled to come up with a working image. It’s that damned lens. No matter where I put Scorsese’s portrait, the lens-hole chewed through half his face and made him look like the T-1000 Terminator just after he’d been shotgunned. Either you already happen to have a picture in which all of the content is crowded into the bottom two-thirds of the image, or else you need to design something in two “sections,” as it were. So I now have a one-of-a-kind, limited-edition and completely unauthorized Martin Scorsese video camera. It’s so cool that I kind of don’t even want to use it, for fear of scratching it up. 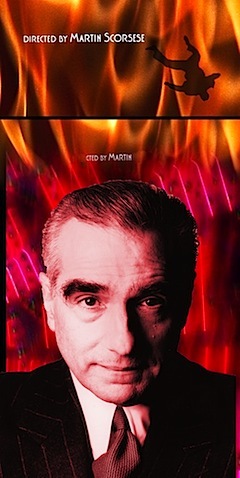 Besides, it’s sort of a shame to use a Martin Scorsese Digital Camcorder without a special Thelma Schoonmaker-themed edition of iMovie, isn’t it?